We continue our series on the top draftable players entering the 2013 season. Depending on the scheme, NFL teams look for different things in an outside linebacker. 3-4 teams like guys that can get after the passer. They may not care if a linebacker can drop into coverage if he has very good pass rushing skills. 4-3 teams like more versatility from their linebackers. Coverage skills may be more important to them, especially on the strong side. A term you will hear over and over is “3 down linebacker” which means the player can stay on the field on passing downs to either rush the passer or drop into coverage. NFL teams want a linebacker that doesn’t have to be taken off the field in nickel and dime packages. The list of outside linebackers available for this year’s draft is impressive, especially the top three. This is our list of the top 5 outside linebackers for the 2014 draft. 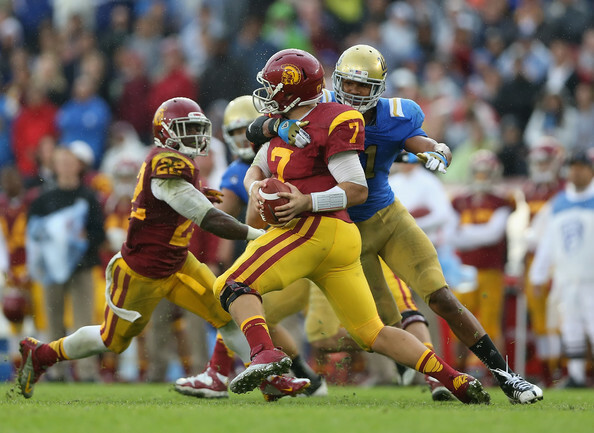 Anthony Barr played his first two seasons at UCLA as a running back/fullback. During the spring of 2012, he met with coach Jim Mora and requested a move to linebacker. Barr made the move look easy and has become one of the most disruptive linebackers in the country. In his first season on the defensive side of the ball, he was a 2nd team All-American and 1st team All-PAC 12 selection. Barr tied for #2 in the country with 13 sacks and tied for 7th nationally with 21 tackles for loss. He also forced 4 fumbles. For someone with only one year of experience at the position, Barr showed very good instincts. He has good power and agility and is still working to develop a swim move. It’s scary how good this guy could be with a little more experience. I love to watch Kyle Van Noy play football! He may be the most well-rounded football player in this year’s draft class. He always seems to be around the ball making plays. When BYU needs a big play, Van Noy steps up and he can do anything you need defensively. Just look at his box score against San Diego State in the Poinsettia Bowl. In that game he had 8 tackles, 3.5 tackles for loss, 1.5 sacks, a blocked punt, a 17 yard pick six and a QB strip/recovery for a touchdown. On that day, he put his team on his back and willed them to a win. Van Noy tied for #2 in the country with 13 sacks and was 4th nationally with 22 tackles for loss. I really believe that if he had declared for the 2013 NFL Draft, he would have been a top 15 pick. Instead, Van Noy decided to return for his senior season. He may go even higher this year. I had him as a sleeper pick for the first round in 2013, but since he delayed that one year, I believe he will be a top 15, maybe even top 10 pick in 2014. C.J. Mosley led his team with 107 tackles. He was a consensus 1st team All-American and 1st team All-SEC selection. Mosley is fast and athletic and he is very good in pass coverage. He burst onto the scene with a 16 yard pick six last year against Michigan. Mosley is an active player that quickly reads his keys and then reacts. He has the strength to take on blockers and the speed to run right through them. Mosley uses his speed to chase plays sideline to sideline. Mosley’s versatility and ability to stay on the field on third down will make him a valuable commodity in April. Adrian Hubbard gives Alabama a good 1-2 punch at outside linebacker. Hubbard is a big, long outside linebacker with good pass rush skills. He led his team and was 6th in the SEC with 7 sacks and he had 11 tackles for loss. Hubbard has a combination of power, length and flexibility that builds up speed quickly. His best pass rush move is the speed rush, but he also can use a bull rush to catch his opponent off guard. Despite his 6’6” height, he bends well to take on the run and play with leverage while rushing the passer. Hubbard is a versatile player that can stay on the field on 3rd down and will some NFL team will fall in love with him. Ryan Shazier was forced into the lineup as a freshman due to an injury to Keith Sweat. Shazier responded with 33 tackles in three games and he had 15 tackles against Penn State. Last year he led the Buckeyes with 114 tackles, 17 tackles for loss and was #2 on the team with 5 sacks. He was also third on the team with 10 passes defensed. Shazier is extremely athletic and has added strength in the offseason. He is very active and has a great closing burst on the ball carrier. Shazier has a very good motor and a tough attitude which will serve him well in the NFL. If he had a little more weight, I believe he could even play inside. This entry was posted on August 25, 2013 by draftmaniacs in Top 5 at each position and tagged 2014 NFL draft, Adrian Hubbard, Alabama football, Anthony Barr, Bruins football, Buckeye football, BYU Football, C.J. Mosley, Cougar football, Crimson Tide football, Kyle Van Noy, NFL, NFL Draft, Ohio State football, Ryan Shazier, UCLA football.